Imagine your art being responsible for one of the most recognized people on the planet, via one of the most recognized brands on the planet! Haddon Sundblom was such a person. 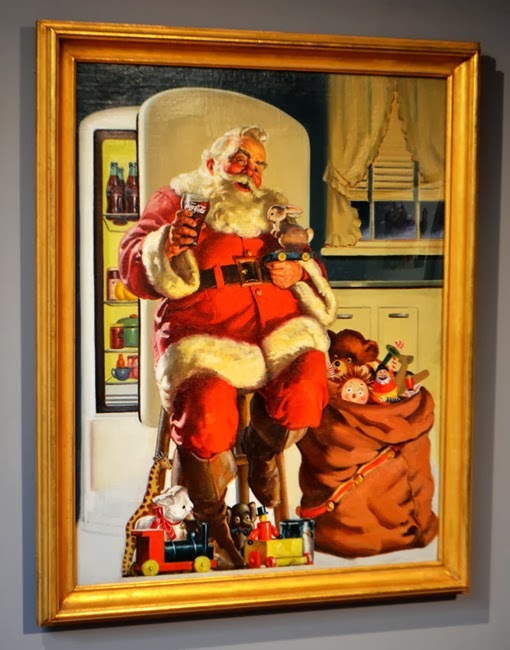 Through December 8, the Oglethorpe University Museum of Art brings us a glimpse of that marketing genius in the exhibition Haddon Sundblom: Santa Paintings. Conceived during The Great Depression, Sundblom gave us the Santa that so many around the world now know, love, and recognize today. Mass marketing had created many, many versions of Santa, but he was later more standardized by famous artists including Thomas Nast, J.C. Leyendecker, and Norman Rockwell. 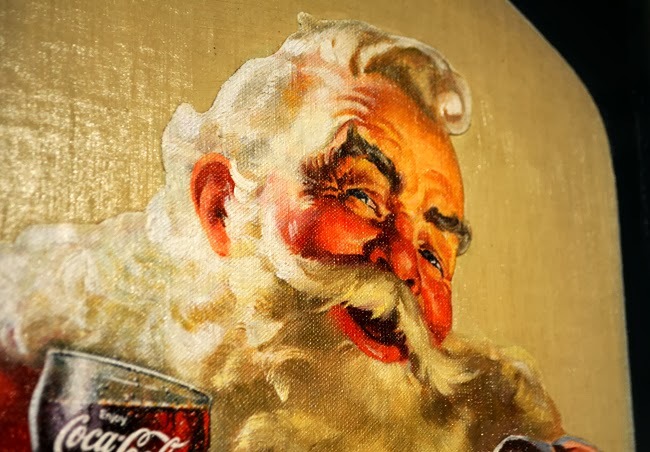 In 1931, The Coca-Cola Company contracted Sundblom to create a "Coca-Cola Santa" painting that would be used in their marketing materials, specifically to encourage consumers to drink Coca-Cola during the winter months. Up to that time, Coke was widely considered a summer drink. Now, there's a testament to how times have changed! Sundblom created for The Coca-Cola Company at least one Santa painting every year through 1964! I'd like to offer an enthusiastic "Thank you" to Oglethorpe for the show and to The Coca-Cola Company for contributing their works to this exhibition. What a wonderful opportunity to see such a remarkable and festive aspect of American culture and cherished history. 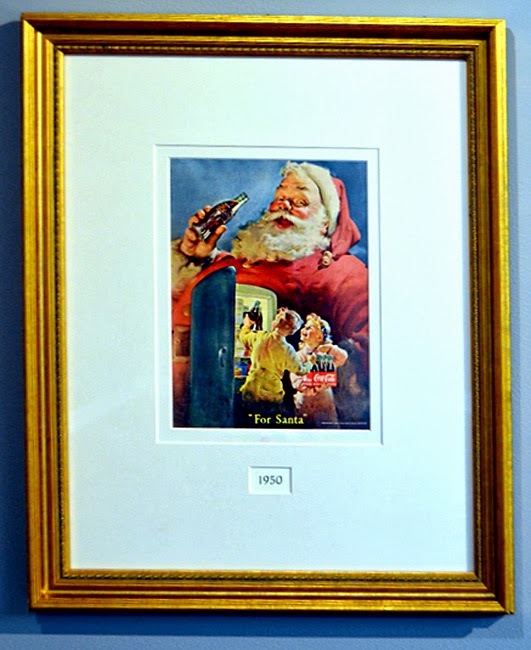 For the record, Sundblom used the popular Clement Clarke Moore poem T'was the Night Before Christmas as inspiration for this Santa paintings, a theme that remained constant throughout his time painting for the company. 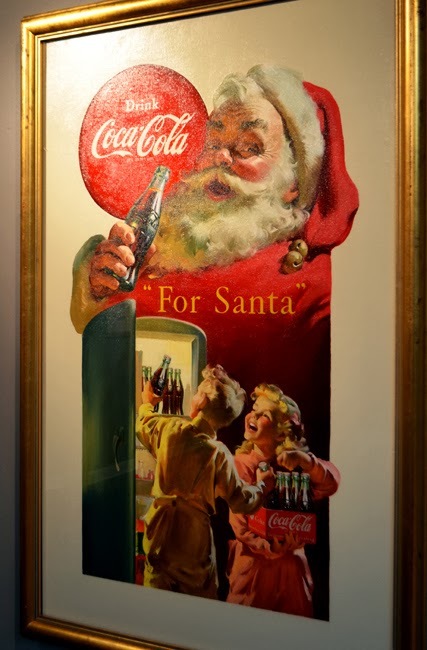 In the exhibition, with the many Coca-Cola Santa original paintings are ads based on those paintings. Actually, when I first ventured into Skylight Gallery, I didn't realize that what's what is on display—Sundblom's original paintings! What a wonderful surprise...they're magnificent! Although I'm of Native American (largest percentage), English, and Irish decent, my family followed the Hollander tradition of placing our shoes out on Christmas Eve. The familiarity to the actual tradition—placing shoes in the window, often with hay or carrots inside as a wishful trade for sweets—ended with the just the shoes. We placed ours under the tree and sure enough, that's where our individual gifts magically appeared the next morning--next to our shoes! This visit to Oglethorpe was one time that I didn't at all mind seeing Christmas months and months before the actual holiday. 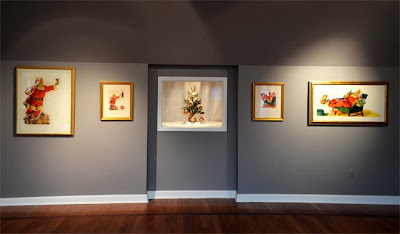 Haddon Sundblom: Santa Paintings is on display at Oglethorpe University Museum of Art through Sunday, December 8, along with two other prestige-caliber exhibitions.